The Dabado Bolt Pro is the bigger, faster, and more powerful version of the classic Dabado Bolt, one of the most popular e-rigs on the market. It utilizes *enormous* Pro XL nails for huge clouds and max flavor. It’s powered by an 18650 battery and features a max temperature of 980 degrees Fahrenheit. If you’re looking for one of the most powerful dab rigs out there today, the Bolt Pro is a solid choice that will give you many years of high-quality dabbing. The Bolt Pro kit comes with everything you need to get started with dabbing. You get the actual Bolt Pro itself, which is a large, robust-looking unit that is a significant step up from the original Bolt. You also get one 18650 battery, a magnetic shield, silicon protector and container, and a glass attachment. The Bolt Pro kit also comes with three different nails: ceramic, quartz, and titanium. A USB charger and extremely well-made hardshell case round out the contents of this kit. The Bolt Pro has a similar functionality as the original Bolt. The first thing you’ll want to do is to fill the glass with a *small* amount of water to help make the hits smoother. A little bit goes a long way with this, be careful not to overfill it. Attach the glass on top of the e-nail and, assuming that it’s charged, you’re ready to go. The color-coded LED light lets you know the status of your Bolt: When it’s charging, it’s red. When it’s fully charged, the light turns green. Once you press the button to activate the Bolt, it’ll turn white, letting you know that it’s heating up. Once it flips back to green it’s fully heated and ready to go. Low temperature mode: This setting is ideal for flavor-chasers who want to enjoy milder hits. Press the button 3 times to start and wait for the white light to turn green. In less than 20 seconds, the Bolt Pro will reach 750F and you’ll able to take a hit. To shut it down, press the button an additional 3 times. High temperature mode: If you’re ready to take it to the next level, this setting is ideal for those huge hits that dab rigs are known for. Press the button 5 times, wait for the light to turn green (takes about 30 seconds), and the Bolt will be ready to go at 850 degrees Fahrenheit. To turn it off, press the button 5 more times. I tested out both temperature settings and was thoroughly impressed. The low temperature setting was great for those more casual dab sessions when I didn’t feel like going too hard. The high temperature setting was great for those hard hits and for blowing huge clouds. All three nails (quartz, titanium, and ceramic) worked perfectly. I’m partial to the ceramic nail myself because it seemed to give the best balance between flavor and clouds, but it’s really a matter of personal preference. The Bolt Pro is a massive improvement on the original Bolt, which is one of the most popular e-rigs on the market. It gives you much more power and a much smoother dabbing experience. Dabado has proven itself to be one of the biggest names in the e-nail market, and this latest version of the Bolt is sure to make them a household name amongst serious dabbers. 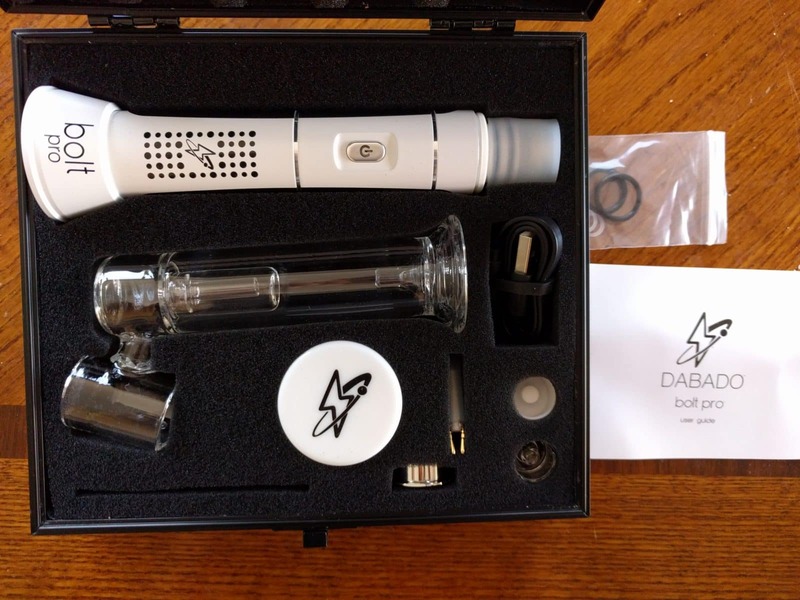 The best place to buy the Bolt Pro is directly from Dabado for $199.99. Previous articleKoi CBD Review: Yay or Nay?